Summary: When Suzy is in first grade, her father is deployed to fight in Viet Nam for a year. 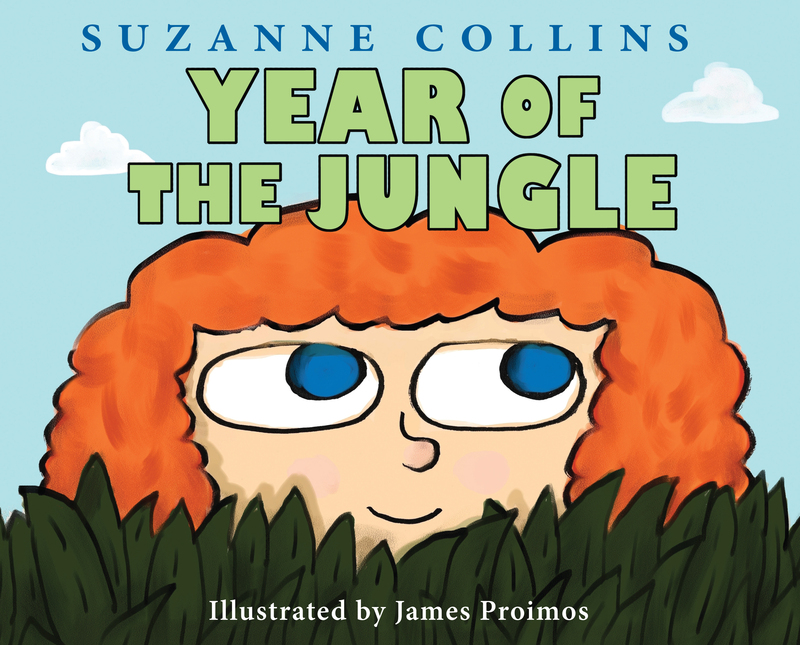 Although she begins the time of separation in naïve musings about what it must be like to be in the jungle like her favorite cartoon character, she gradually intuits that her father is in real danger, and she must deal with her growing fear. Literary elements at work in the story: Collins does a superb job of remembering what it was like to be six years old and trying to connect the dots about one’s world. As the first-person narrator begins to hear the worry in the voices of the adults around her, she puts the puzzle pieces together bit by bit and eventually realizes that her father may be in great danger. Proimos’ childlike cartoon illustrations mirror the narrator’s growing unease. Intermittent two-page dream sequences evolve from a scene of happy jungle animals welcoming Suzy and her cat Rascal, to a portrait of the same (now slightly menacing) animals wearing Halloween masks, to a final frightening landscape of tanks and machine guns and helicopters surrounding Suzy and Rascal as they run away. This skilled character development makes the story both sweet and alarming. How does the perspective on gender/race/culture/economics/ability make a difference to the story? This is a story of a close-knit loving middle class family. When this stressful year of separation comes, the reader can tell that the adults have tried hard to keep the family traditions as normal as possible. Suzy’s brother reads the comics to her on Sundays and they celebrate Halloween, Thanksgiving, and Christmas. However, some things are not normal, and Suzy becomes more and more fearful despite her family’s best efforts. Fear is an equal opportunity visitor, no matter what one’s socio-economic status is. Theological conversation partners: Fear is a part of every human life, and the lives of young children are certainly no exception. The author begins and ends this autobiographical reflection on a particularly troubling year in her life with an image of her father reading her a poem by Ogden Nash about a dragon named Custard. Although Custard is always afraid, he faces the things which frighten him, a mark of true bravery. Scripture is full of human fear (e.g., Psalm 23, Psalm 27:1, Psalm 118:6). Although we do know that Suzy’s family is at least somewhat religious – one of her dad’s postcards asks her to pray for him, and she makes her first communion during the year that he is away – we don’t hear any of the adults in her life reassuring her with faith talk of an ever-present God who can comfort her fears. Nevertheless, this story might be a jumping-off point for a discussion about what people of faith do in the face of fear. Why do you think that Suzy’s dad has to go to Viet Nam? What do you know about war? Do you think that Suzy is worried about her dad? Why or why not? Are there things which worry you? What are they? What comforts you when you are worried? The Year of the Jungle by Storypath is licensed under a Creative Commons Attribution-NonCommercial 4.0 International License.